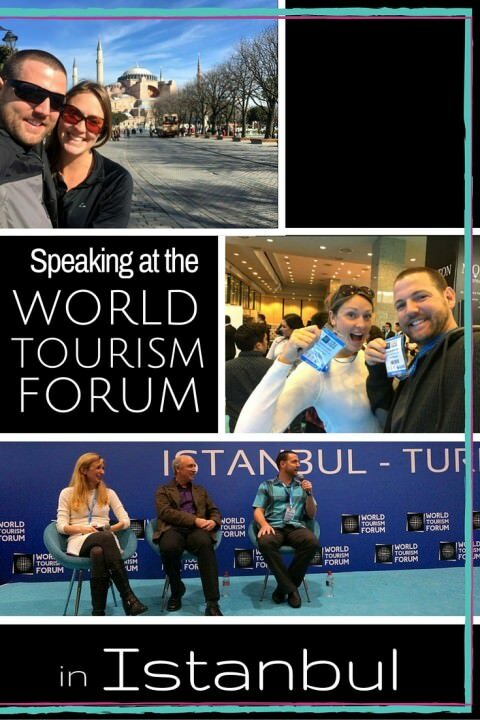 In October, we received an invitation to speak at the World Tourism Forum. The formal invitation named Mr. Kofi Annan (the former UN Secretary General) as the main speaker, and in previous years the president of Sweden was a speaker, as were many other top executive officers and political figures. Obviously this email was spam, why would they want the Goats to speak alongside these types of people? We promptly deleted it. 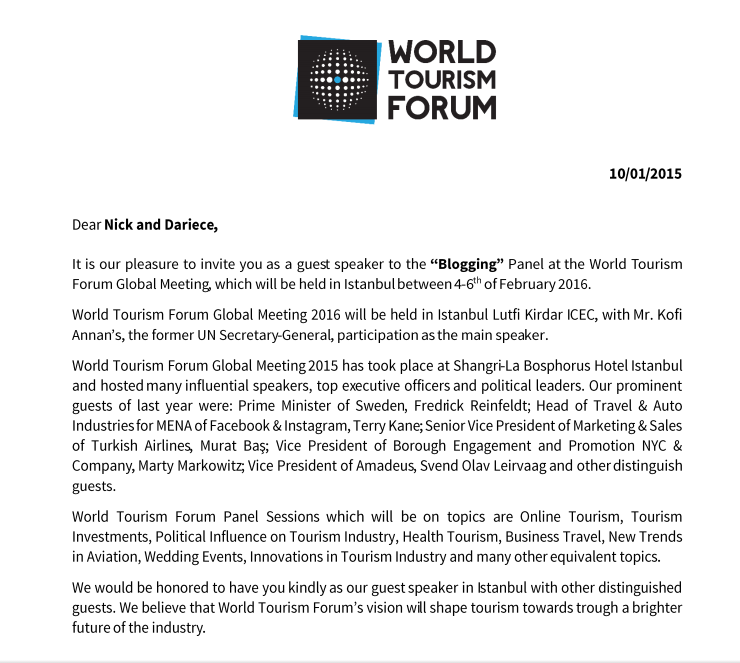 While in New York, we ran into another blogger, who told us that he had received the same email and that it was actually a legitimate invite to speak at the prestigious World Tourism Forum in Istanbul! This event brings people from all sectors of the tourism industry together to discuss the future of travel and tourism. As soon as we returned from NYC, we removed the email from the virtual trashcan and started chatting with the organizer of the “blogging session”. We had to wait four months until the day finally arrived. Four months of planning our speeches, thinking about power points, and deciding on which videos we would share. This would be the first time that we had done any public speaking for our website, so as you can imagine, we were very nervous…but at the same time, excited and honoured to have been asked to not only attend, but to speak. As time went on, the plans and theme for the blogging session changed too many times to count. This was frustrating and made it difficult for us to prepare – which in turn just made us (me) more stressed out! 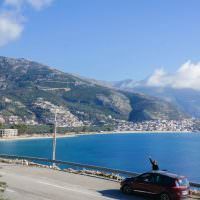 With just a few days left before we were to fly from Albania to Turkey, plans changed yet again and we received an email that said we had to decide who would speak at the forum – me, or Nick. 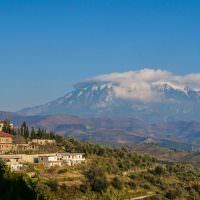 Enjoying a beautiful day in Turkey…before deciding who speaks! The entire time we had planned on it being the both of us on the panel, while having with each other to lean on for support. But suddenly we needed to make a decision. We sort of sat there looking at one another and decided we would figure it out later. It was one of those decisions that we didn’t want to make, so we just put it off. Ultimately, after some serious consideration, we decided that Nick would do it. I could have done it, but felt like Nick was the man for the job at this event. He figured either one of us would have represented Goats On The Road and the blogging industry very well, but Nick took one for the team this time around. 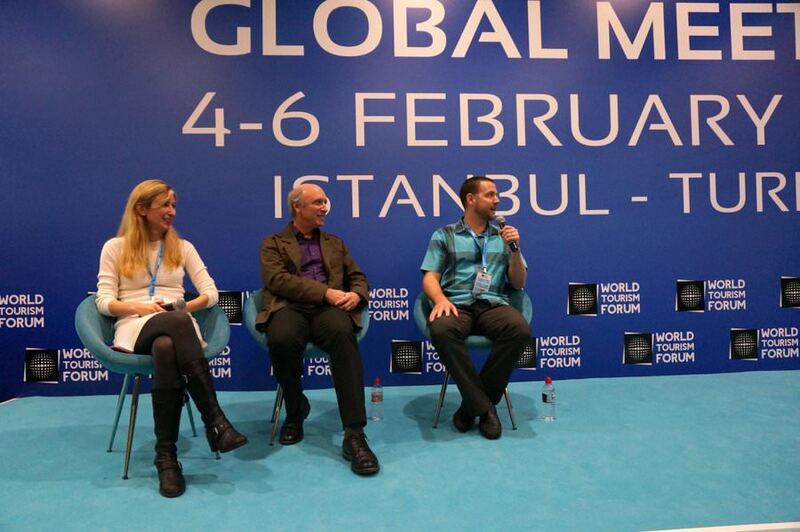 We arrived in Istanbul on February 2nd, but the forum didn’t start until February 4th. This meant that we had 5 nights at the lovely W Hotel (which, funnily enough, is the same hotel that we stayed with in NYC). 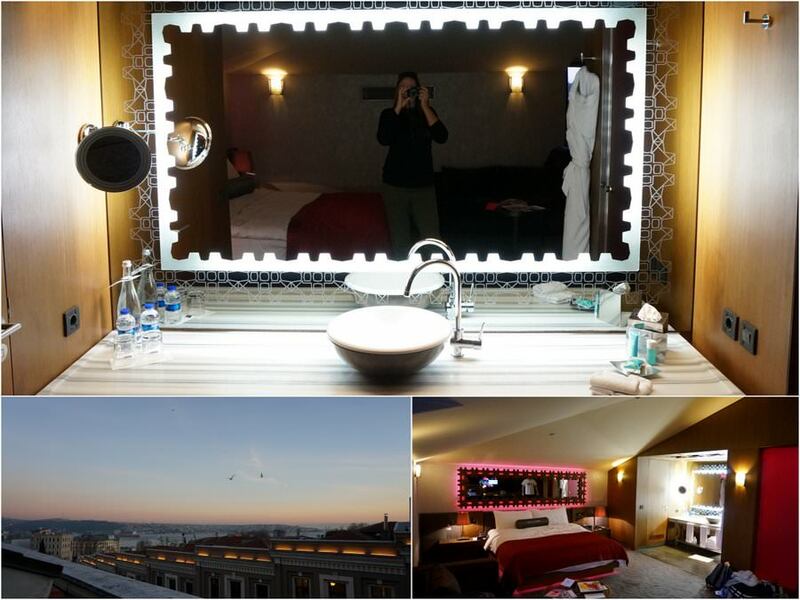 Our room at the W Hotel in Istanbul, not too shabby! 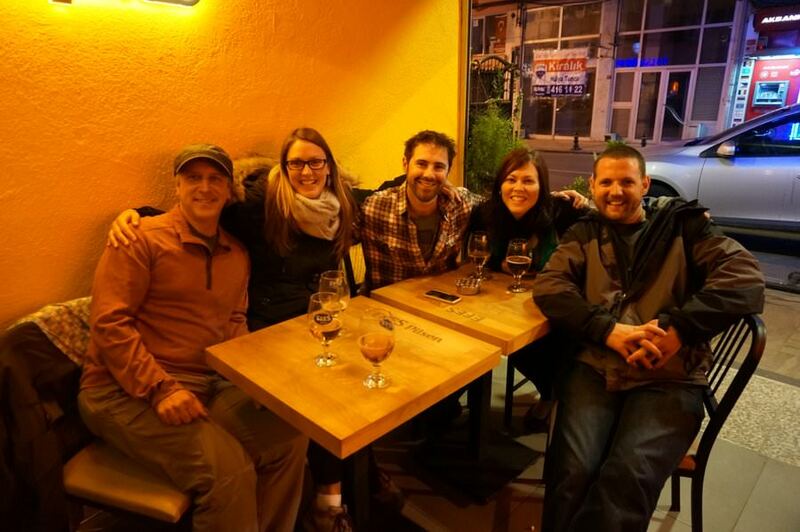 After unpacking a bit, we met up with some other awesome bloggers who arrived early as well – Tim Leffel who we met when we were in Guanajuato, Mexico and Jarryd, who we travelled with in Plovdiv, Bulgaria, and Alesha, Jarryd’s soon-to-be wife and travel blog partner. We all had a great time that night catching up over some beers at a little hole-in-the-wall spot in the Akaretler neighbourhood of Istanbul, and ended up going home way too late. It was great to reunite with Tim and Jarryd, and to meet Alesha for the first time! 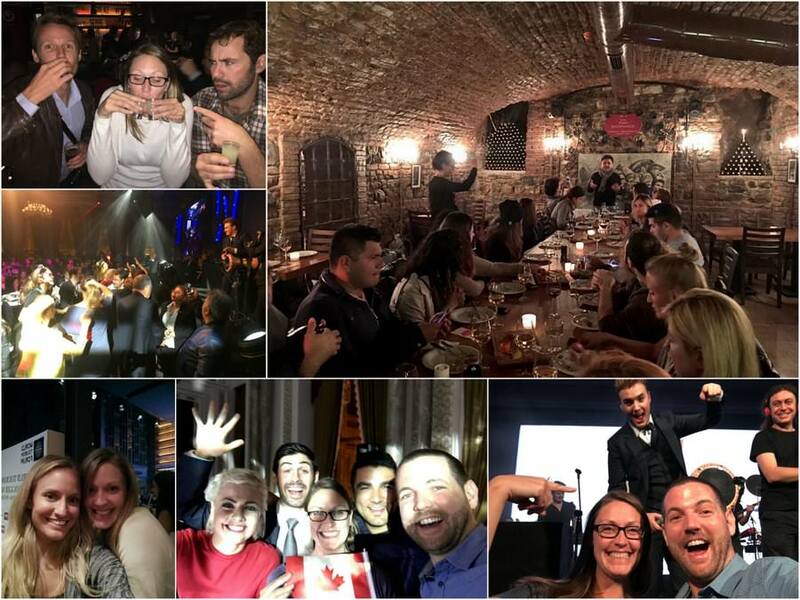 As more and more bloggers arrived from all over the world, our excitement levels rose and we became aware of just how huge this event actually was. People flew in from South Africa, Thailand, Canada, The USA, India, Mexico, Spain and Japan (to name a few countries), to attend, or partake in this event. 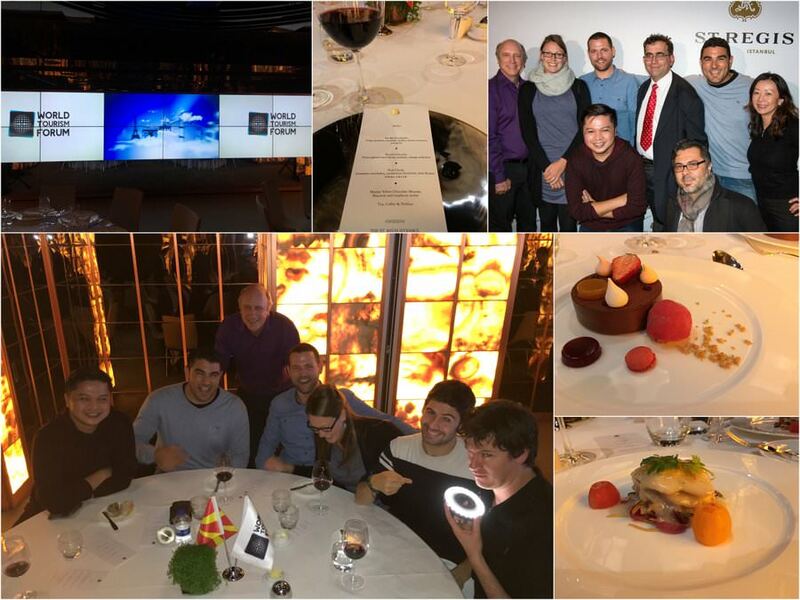 On February 3rd, there was a speaker’s dinner at the gorgeous St. Regis Hotel. Everyone who was speaking at the conference in every sector was invited (plus some sneaky tag-alongs). We mingled, had some wine, ate delicious food, and of course, the table full of bloggers was having the most fun! We were invited to many different events over the course of the forum, including the Blogger Party night at the new Populist Bar (with an open bar and tapas food), the gala dinner at the incredible Ciragan Palace Kempinski with the famous Mustafa Ceceli rocking out on stage, and the “final supper” which was a lovely night for all of the bloggers, both foreign and Turkish, at the Tarihi Pano Şaraphanesi restaurant. Needless to say, there was a lot of good times being had! Oh yes, there were a lot of fun times! Bloggers are crazy! February 4th marked the opening ceremonies of the World Tourism Forum. It also marked the first time that Nick and I had ever used a translating machine. A couple of the main speeches were in Turkish, so we plugged in to hear the speeches in English. We received our “speakers” badges and made our way around the huge Lütfi Kırdar International Convention and Exhibition Center. Most of the companies and brands in attendance were high-end resorts and hotel chains, as well as some golf companies and Turkish Airlines. We had planned on mingling and networking with many companies such as tourism boards from Iceland, Mexico and Czech Republic, but unfortunately they were no-shows. 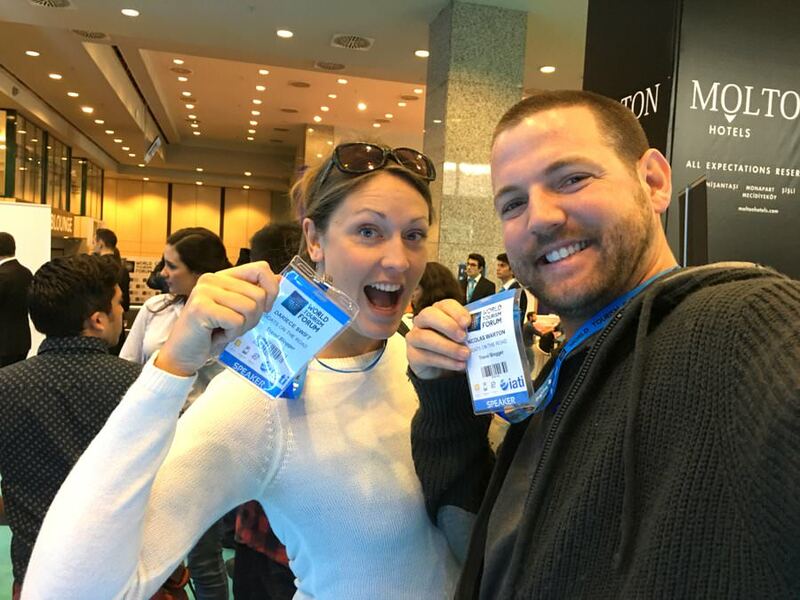 Regardless, we really enjoyed connecting with bloggers who we have followed for many years, including the single reason that we started a travel blog, Johnny Ward of OneStep4Ward.com. It was also really cool to find out that we were the inspiration for some of the bloggers there as well! Travel bloggers are always fun to hangout with, and it was great to be in the company of so many like-minded people. We definitely made some amazing connections and friendships over the 6 days that we were in Istanbul. After attending a few sessions at the conference center and having some late nights out, it was finally time for our Blogging Panel Session. Lining the front row of the audience were all of our new friends, everyone was there to support Nick and the other bloggers who were going to speak. Slowly, the room started to fill, until it was absolutely packed, with people spilling out into the hallway! Thanks for the support awesome people! 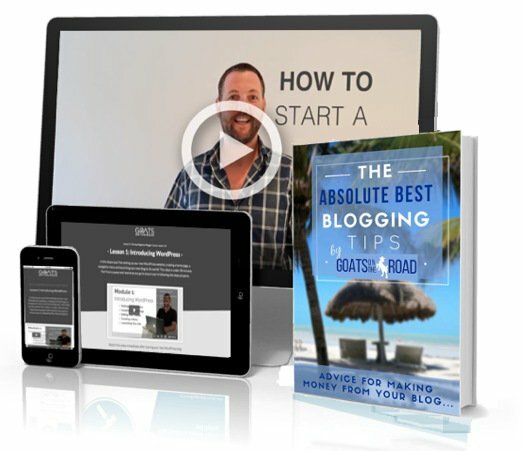 This was exciting for blogging and the industry as a whole. Murat, who is the owner of Blogger Casting, was the moderator of Nick’s session. The other two bloggers on stage were Kristin and Tim, and the three of them spoke as a panel group, answering questions if they had something to say, or, passing the microphone if they didn’t. They discussed the reasons why bloggers are a viable advertising choice for travel companies, how bloggers and businesses can work together to benefit one another, and how we use our blogs to promote brands in the travel industry. The crowd was whistling, cheering and laughing throughout the panel discussion, and at the end, there were two questions from the crowd. Afterwards, Nick was greeted with hugs and high-fives from our fellow bloggers and friends. The support from these awesome people was overwhelming. We had met most of them just days before this event, yet there they were giving advice and support, which meant so much to us. We’ll never forget it! 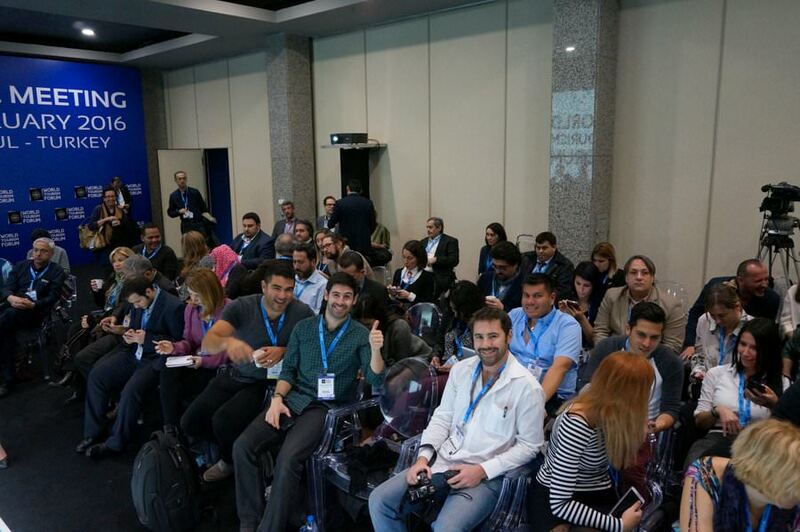 Being invited to speak at this forum was an honour, and even though things started off a bit shaky back in October with coordinating and planning, once we actually got to Istanbul, everything fell into place, and the event ran smoothly. And to be honest, the whole trip ended up being more fun, and worthwhile than we could have ever imagined. We’re so happy that we were invited and hopefully they’ll call us back to the next forum… I believe it’s in UAE! A big thank you to Murat and his team for coordinating all of us bloggers and for planning some really fun events! Another huge thank you to Turkish Airlines for flying us roundtrip, and to the W Hotel for putting us up (and for doing our last-minute ironing and sending up late night room service!) 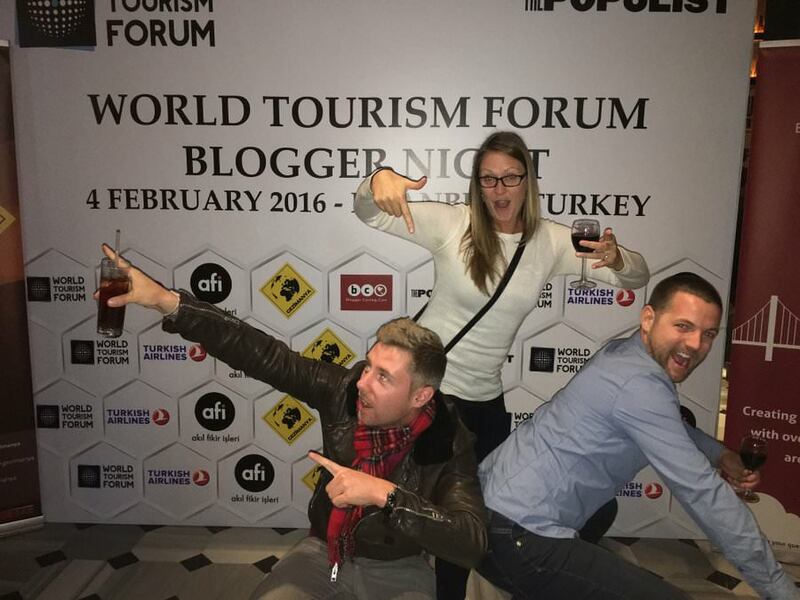 And of course, thank you to the World Tourism Forum for putting on the event and for acknowledging the value in Travel Bloggers. What an event … hope you got a lot out of your time there! We definitely got a lot out of it. Such an incredible experience and honour 🙂 We met so many amazing people. Thank you for reading! I had no doubt it would turn out great. 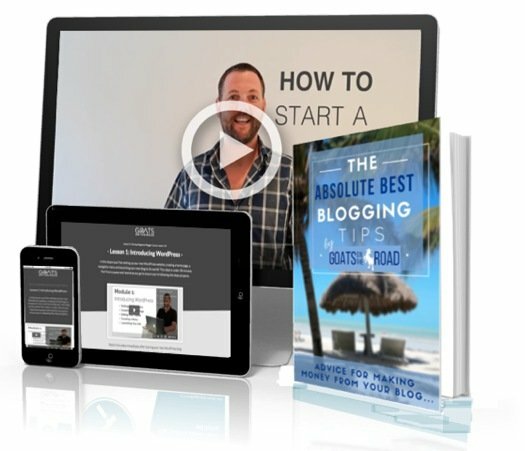 Sounds like an awesome time and a great blogger turnout. Thanks guys! Ya it went really well and was such a great experience. Meeting all of the fellow bloggers was a highlight for sure 🙂 Thanks for reading and commenting! It was so great to finally meet you guys!! Well done with the speaking, you guys can be proud of yourselves! Thank you Sab! Was so cool to finally meet you as well 🙂 Good times! 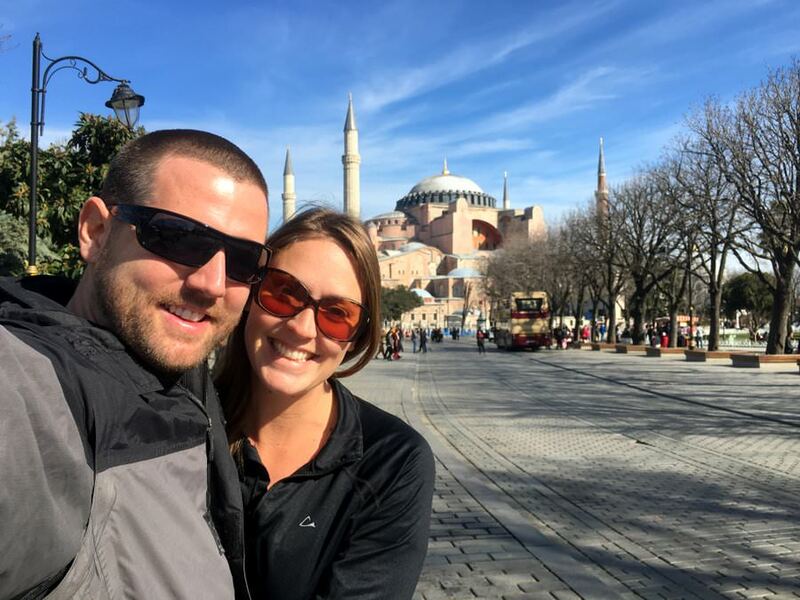 I absolutely loved following you guys on Facebook during your trip to Istanbul! What a fantastic opportunity for you, and a great forum for anyone wanting to be a part of the travel and tourism industry. You guys will benefit immensely from this exposure, and from the networking opportunities and contacts going forward. I bet this will be remembered fondly as an incredible experience shared with wonderful, like-minded people. Thank you for the comment Serhat. We love Istanbul, and Turkey as a whole. We spent 5 weeks there in 2011 as well and will be returning again some day. The recent events are unfortunate and horrible. I hope that things turn around for Istanbul soon!